It’s almost that time of the year when we begin the preparation for everyone’s favorite holiday of the year. While you create a Christmas party checklist, one of your concerns might be the choice of wine. After all, what’s Christmas if you can’t enjoy a delightful and elite class of wine, surrounded by close friends and family. Your wine might just be the highlight of the night. It’s a great idea to find the wine that can appeal to your guests’ palette and complement the night. What Kind of Wine Should You Buy? To begin the evening, you might want to start things off with a toast to celebrate the gathering of all your friends and family who have managed to be present for the day. It will seem like the perfect beginning to a night. With this done, the rest of the night’s wine needs to be considered. Take into account who’s attending. Are they going to be youngsters, older relatives, or non-drinkers? If your dinner menu consists of rich meats, you should consider a full-bodied red wine. If the food is along the lines of fish, consider opting for rosé, white wine or a light red wine. You don’t need the heavy bodied effects of stronger wines. Is it a formal event, or a casual family or friends’ gathering? All kinds of red wines make for classic favorites. You can never really go wrong with it. This is especially a great option if you’re serving meats and cheese. Your focus is that the meat and wine choice must complement each other; instead of overpowering your palette. To make this simpler, consider this: the leaner the red meat, the lighter the red wine. A prime rib will pair beautifully with strong and high tannin wine that have a bold and acidic taste. Consider the Chianti Classico red wine or the Chianti Classico Riserva for this. The wine is produced from the region’s best Sangiovese grapes. On the other hand, if you’re serving lamb, the light and delicate texture demands a rather smooth red wine with lighter tannin. Unless your guests are passionate about the bold and strong textures of red wine, consider in Chardonnay for a buttery, lighter and zestier wine choice. This kind of wine works best for first course meals, white meats, fresh cheeses and fish-based courses. And if you are expecting some light-drinkers or younger guests, lighter is always better for the first time. How Much Wine Should You Get? For a general rule of thumb, you should estimate 1 bottle for approximately 4-5 guests. That is an average estimation of about 2 glasses per person. So, if you’re expecting 20 guests, you should order about 5 bottles. It would be extremely valuable if you personally know the preference of your guests. For instance, out of the 20 invitees, 3-4 perhaps may not be enthusiastic wine drinkers; or on the other hand, all of your 20 guests may be passionate about wine. 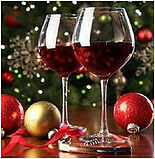 Make your guest list, and order in your Christmas wine from the best wine-making regions in the world – Chianti. You can now buy Chianti wine and have the best in Italian wines delivered to you at your doorstep. Also keep an eye out for an amazing Christmas gift that we have in store.